The Best Cystic Fibrosis blogs from thousands of top Cystic Fibrosis blogs in our index using search and social metrics. Data will be refreshed once a week. Also check out Top Cystic Fibrosis Youtube Channels list for Top videos on Cystic Fibrosis. About Blog Cystic Fibrosis News Today is a digital news publication dedicated to offering comprehensive daily news coverage of CF. Read the latest Cystic Fibrosis news and articles. Stay informed about approved therapies, new medications and developments to treat CF. Facebook fans 17,958. Twitter followers 3,394. About Blog The purpose of USACFA is to provide a source of information for CF adults regarding the basis, nature and progression of the disease, as well as the latest treatments and research to fight it. It also offers a forum for CF adults to communicate with each other. Our many columnists provide insights on a wide variety of subjects related to CF. Facebook fans 1,543. Twitter followers 663. Headquarters in Bethesda, MD About Blog A worldwide Cystic Fibrosis community combining cultures, nationalities and age groups. The mission of the Cystic Fibrosis Foundation is to cure cystic fibrosis and to provide all people with the disease the opportunity to lead full, productive lives by funding research and drug development, promoting individualized treatment, and ensuring access to high-quality, specialized care. Facebook fans 223,330. Twitter followers 25,913. About Blog We are daily vloggers on Youtube sharing this crazy journey called life with all of you. Laugh with us. Cry with us. See the world with us. Get a glimpse of life with Cystic Fibrosis. Be encouraged as you watch our videos... we hope they make your smile and and bring joy to your day. Welcome to THE FREY LIFE! Facebook fans 21,736. Twitter followers 6,998. United Kingdom About Blog The Cystic Fibrosis Trust is the only UK-wide charity dedicated to fighting for a life unlimited by cystic fibrosis (CF) for everyone affected by the condition. Our mission is to create a world where being born with CF no longer carries a death sentence, when everyone living with the condition will be able to look forward to a long, healthy life. Facebook fans 86,068. Twitter followers 24,098. About Blog Cystic Fibrosis (CF) is the most common, genetically acquired, life-shortening chronic illness affecting young Australians today. Understand the risks, the effects and how to best live your life. Facebook fans 4,954. Twitter followers n/a. Toronto, Ontario About Blog Cystic Fibrosis Canada is a national charitable not-for-profit corporation committed to finding a cure for cystic fibrosis (CF). We invest more in life-saving CF research and care than any other non-governmental agency in Canada. Facebook fans 14,123. Twitter followers 5,054. About Blog The Journal of Cystic Fibrosis is the official journal of the European Cystic Fibrosis Society. The journal is devoted to promoting the research and treatment of cystic fibrosis. To this end the journal publishes original scientific articles, editorials, case reports, short communications and other information relevant to cystic fibrosis. About Blog A community for people who suffer from, or know someone with, the debilitating illness known as Cystic Fibrosis. Texas About Blog Cystic fibrosis is a life-threatening genetic disease that causes mucus to build up and clog some of the organs in the body, particularly the lungs and pancreas. When mucus clogs the lungs, it can make breathing very difficult. The thick mucus also causes bacteria (or germs) to get stuck in the airways, which causes inflammation (or swelling) and infections that lead to lung damage. California About Blog Claire Wineland is founder of Claire's Place Foundation, a 501c3 committed to helping others living with cystic fibrosis like herself. Our mission is to heighten public awareness about Cystic Fibrosis and improve the quality of life for the families it affects by providing education, life skills, inspiration, and positive support. Facebook fans 6,860. Twitter followers 11,833. Ireland About Blog Continent Chasers Wife & Cystic Fibrosis Husband From Poland and Ireland travelling the world 84 countries. Mission is to Visit Each Country on the planet and to highlight Cystic Fibrosis and to show that serious illness doesn't have to stop you following your dreams. Facebook fans 1,368. Twitter followers 1,851. About Blog Cystic Fibrosis New Zealand is the only dedicated organisation caring for the social, emotional and financial needs of the 500 people in NZ who have the condition. CFANZ will optimise quality of life for people with cystic fibrosis and their families; striving for normal life expectancy. United States About Blog IV Solutions is a full service cystic fibrosis pharmacy that provides home infusion treatments, respiratory inhalation therapies, and specialty CF medications. Since 1986, we’ve been there to help cystic fibrosis patients along with their families and healthcare providers. We’re here to support you through individualized instruction, proactive refill reminders, on-going care coordination. Facebook fans 8,528. Twitter followers 210. About Blog Once you choose hope, anything’s possible. it’s also a good way for me to connect with others in the CF community. Others in my situation may find it comforting to see they aren’t alone. Blog by jordan. Leicester, England About Blog Stanley-Ray was diagnosed with cystic fibrosis at 20 days old, this facebook page is to keep people updated on his progress & to raise funds for CF trust. Facebook fans 594. Twitter followers 366. About Blog Blog by Somer Love, I created Love To Breathe® to educate and raise awareness about Cystic Fibrosis and spread Love whenever I can. I want to change the world... Join my fight! Facebook fans 7,948. Twitter followers 1,166. About Blog My personal spin with Cystic Fibrosis tips, tricks, positive outlooks. All while making my dreams come true! "Always Smile. I want to encourage everyone with CF young or old to reach for you dreams, no matter how big or small they can be. As long as you have the right attitude in life, your disease will not bring you down! Facebook fans 4,917. Twitter followers n/a. Portsmouth, England About Blog CF Kids helps by providing equipment, such as nebulisers, which can be an essential part of a CF Kids daily routine at home, but may not be available because of the NHS budget. We also provide exercise equipment and lessons, plus have a number of other services we offer to families in the Portsmouth and Southampton areas. Facebook fans 1,010. Twitter followers 3,122. Peoria, Illinois About Blog Spreading Awareness about Cystic Fibrosis through sharing our experiences in life! AND finding a CURE for CF! Facebook fans 729. Twitter followers 2,442. About Blog A place for me to record the highs and lows of life on the transplant list, and my new life beyond it. Cystic Fibrosis waited 4years for a double lung transplant and finally recieved the gift of life 10.10.11! All views my own. Facebook fans n/a. Twitter followers 3,843. Hershey, PA About Blog Blog by Erin Moore, I'm just a mom with 3 wonderful kids, two of which are twins, one of which has Cystic Fibrosis, and I want to share my thoughts. This blog, 66 Roses, is dedicated to finding the cure. Facebook fans 396. Twitter followers 1,848. Bozeman, MT About Blog The Cody Dieruf Benefit Foundation was formed in March of 2006 in honor of Cody Dieruf who passed away from Cystic Fibrosis at 23 years old. Uniting communities and families living with Cystic Fibrosis by raising awareness, providing emotional and financial assistance, encouraging health management, and inspiring life experiences. Facebook fans 1,805. Twitter followers 4. The Yukon About Blog A mom, her CF warrior, and our journey through life, love and hardships. Striving for a cure, trying to raise awareness. Facebook fans 489. Twitter followers 640. Cobham, Surrey About Blog Blog by George. I started this blog back in January 2012. At first i didnt want this to be a public blog, just some where i could write my thoughts and feelings, sort of a diary and journey through my time getting on and waiting on the transplant list. Facebook fans n/a. Twitter followers 1,069. About Blog A blog to inspire members of the CF community to live positively and embrace everything life has to offer. Thriving with a chronic illness, cystic fibrosis. About Blog A blog about Eli. A blog about survival - and by that, I mean life! Eli, a boy living cystic fibrosis. We are all about living and ❤️ adventure. I write to shed light on life with CF - and mostly, that means writing about the game of survival called life. We do our best at wellness and nutrition to keep the tribe, and Eli, as healthy as possible. Facebook fans 281. Twitter followers 493. London About Blog Tim Wotton, a Cystic Fibrosis sufferer, has been defying the odds for over 43 years and is sharing his life lessons and experiences. After counting down to the massive 40 milestone in 2011, he is now regularly sharing his trials and tribulations via this blog. Facebook fans n/a. Twitter followers 690. Wisconsin, USA About Blog A blog about living life to the fullest despite battling Cystic Fibrosis, a genetic lung disease. Facebook fans 336. Twitter followers 318. Sanford, NC About Blog This is my life... Cystic Fibrosis. Friends. Family. Music. Animals. Love. Faith. God. Miracles. Dreams. Hope. Coeur d' Alene, ID About Blog I have the most amazing good luck. 8 years ago, my world came crashing down when my newborn baby was diagnosed with the genetic disease cystic fibrosis. Today, we feel like the most fortunate family in the world because we have Kalydeco! Now my goal is to work toward more personalized research, to help bring the most effective treatment to each and every person living with CF! About Blog Former civil servant Donna Sim has joined the growing trend of parent bloggers. She takes you on a journery sharing inspirational moments, as well as personal accounts written with a heavy heart about her life battling Cystic Fibrosis and her struggles to conceive her miracle baby Daisy. Facebook fans 222. Twitter followers 74. Johannesburg About Blog Life is not measured by the number of breaths we take, but by the moments that take our breath away. About Blog Having CF Stinks, but that doesn't stop me! I'll share with you a little about myself, my life with Cystic Fibrosis and anything else that crosses my mind. About Blog Cystic Fibrosis Guernsey’s aim is to give local families and carers friendly support and advice. Local families who suffer with the issues surrounding CF have little or no way of sharing there ups and downs, their problems, we should help each other. Facebook fans 126. Twitter followers 56. About Blog Puff Puff Live is a blog about a lady in her early 30’s who refuses to let CF get her down. She discusses her life with CF and adds recipes to her blog. Idaho Falls, ID About Blog Jamiebug- I have Cystic Fibrosis with Cepacia...Despite being told by almost every hospital in the country that I was not a candidate for a lung transplant due to Cepacia- I didn't give up and I found the ONE place that took a chance on me! I am almost 3 years post transplant and I feel great! You will learn of her thoughts, feelings and how she got through each day. Facebook fans 89. Twitter followers 43. About Blog A lot of people ask me what made me decide to start writing a blog. I first got the idea after finding out that I might need a transplant. This blog is to raise awareness too, and that has been the biggest blessing I could have asked for. I have people reading my blog and learning about what Cystic Fibrosis is. About Blog Hello, and welcome to my occasional blog about sailing adventures with friends. I aim to raise funds for the Cystic Fibrosis Trust through sponsorship, so please consider making a donation to the trust via the link on this website to help us to beat this dreadful disease that limits the lives of so many young people. I do hope you enjoy reading my blog. About Blog The ongoing story of a child living with Cystic Fibrosis. You'll stay updated on Azer's life with CF, and how much he can do, even with having Cystic Fibrosis. About Blog I created this blog to raise awareness about CF through sharing my personal experiences and perspective. I hope to dispel some of the myths and provide a basic education on my experiences with Cystic Fibrosis. Blog by Therapink. Oregon, United States About Blog The one thing that many don't realize about Cystic Fibrosis is how isolating it can be. We are discouraged to spend any quality time together unless we abide by strict infection control protocols. With that being said, many CF'ers and their families have sort of decided to stay away for one another in a best practices effort to not cross contaminate. About Blog Desiring to be more like Christ through the trials and joys of this life. On The Journey of Faith you will read about how a mom and family deal with the fact that they have a child with CF. You will read about the fun and happy times as well as trying times. About Blog Leaving a digital record for my family & virtual friends. About Blog I like cats, iced coffee and the color purple. I like reading, writing, making soap and thinking about what's next. I am a double lung transplant patient with cystic fibrosis. About Blog Blog by Suzanne. Blogging about home, life, living with Cystic Fibrosis, gardening, general love for all things vintage, and reasons why those topics are more interesting than they sound. About Blog Two Salty Boys discusses the ride of a lifetime, having two boys that both have CF. You will read about the rollercoaster of life issues on this blog. About Blog Colleen’s blog is about how she tries to incorporate Live, Love, Laugh into her daily life with CF. About Blog A blog about mothering despite Cystic Fibrosis.The owner of this blog discusses her journey through life as a wife and mother. However, she has one thing that increases her challenges to these things. She has CF. About Blog Blue Eyed Breather is a blog about a young lady who strives to live a normal life. Emily blogs about the good and the not so good in her life and about her walk with God. About Blog Ports, Pills & Parties is written by a teenager who has CF. She strives to live a normal teenage life in spite of her disease. About Blog A blog about life with cystic fibrosis and my journey through the world of lung transplant. About Blog When Life Gives you Lemon is published by a mom of a little guy that has CF. You will read about her daily life as well as how to care for a child with CF. About Blog I am a military wife, bonus mom and happen to have Cystic Fibrosis (CF).I am not a medical expert and this is just my story. About Blog A CFer's Joyous Journey Through Life. I hope you enjoy reading about how I live my life as CFer! My dream job is to work with other cystic fibrosis patients as a Registered Dietitian Nutritionist (RDN) to help them gain weight so that they can live a longer, healthier life. About Blog Strength for today and BRIGHT HOPE for tomorrow! I am a 39-year-old woman with cystic fibrosis. I am also a daugher, sister, wife, mother, teacher and friend. Most importantly I'm God's child. This blog is about my life including the challenges and blessings of living with cystic fibrosis, my faith, my family, and more! About Blog A blog about my beautiful life living with Cystic Fibrosis: to educate and help promote awareness and understanding associated with CF. Dedicated to sharing my experiences of the good, the bad, the ugly, and the funny, so that all who so eagerly support the fight against CF, will know how much their love and support truly means. About Blog Following my life with Cystic fibrosis. About Blog I want to write about my cf journey for a bunch of reasons to Connect, Share, Spread awareness and educate, Importance of Exercise, Inspire and encourage, Thankfulness. Embracing life's journey with cystic fibrosis. About Blog Cystic Fibrosis is part of our family now on Earth, but we know that Cystic Fibrosis is not forever, but our family is! About Blog Hello I'm Tanner. Blessed to be the mother to R, friend to many, follower of Christ, and advocate for Cystic Fibrosis. Roanan was diagnosed at 4 weeks with Cystic Fibrosis. This blog is our journey battling CF and trusting God through it all. About Blog Welcome! I am Kimberly, the mother of two precious little girls who live with Cystic Fibrosis. And this is my space to share our story. About Blog Life with Cystic Fibrosis and other random thoughts along the way. 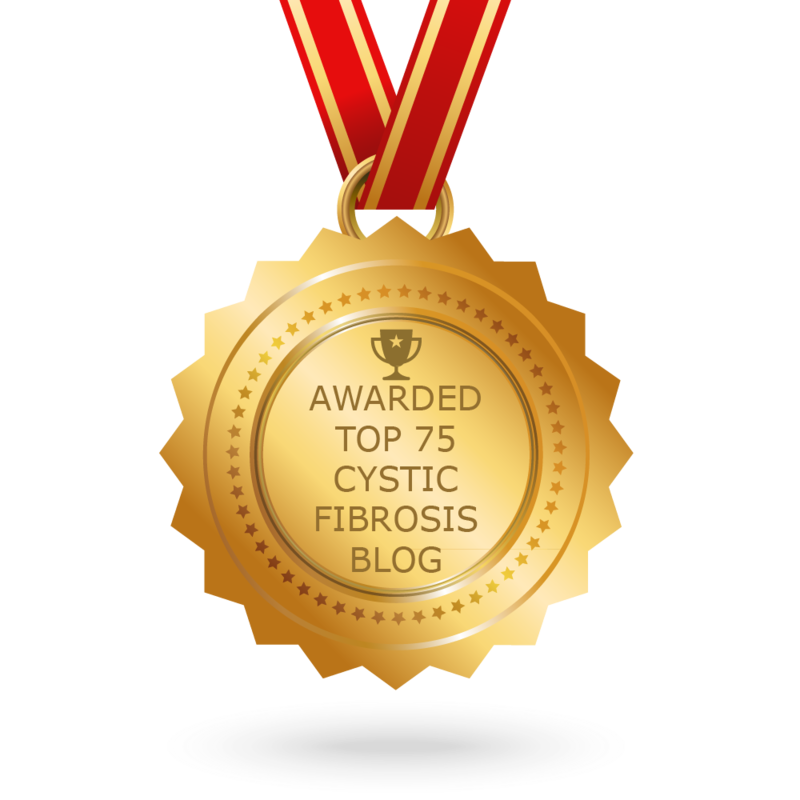 CONGRATULATIONS to every blogger that has made this Top Cystic Fibrosis Blogs list! This is the most comprehensive list of best Cystic Fibrosis blogs on the internet and I’m honoured to have you as part of this! I personally give you a high-five and want to thank you for your contribution to this world.